Rosi Calderon (Mexico DF, 1965) has been a creator since childhood. Away from the noise– she was incapable of setting her mind still when growing up. She would spend hours creating photo collages, recipes and doll houses using shoeboxes and other materials. Paradoxically, when it was time to choose a profession, she opted for the sciences. She got a degree in Pharmacy/Biology from UNAM. “My professors wanted me to dedicate to genetic research; curiously, seeing through the lenses of the microscope there was a whole array of abstract artistic works”, she tells us. She worked for a few years investigating bacteria and discovering mutations. She spent years in various roles: wife, mother, and researcher. In spite of all professional and personal challenges, Rosi couldn’t leave art behind and enrolled in the school of Gilberto Aceves Navarro. Photography, the art she devotes her time these day really came randomly. She lost her camera in a family trip and bought a new one so complex to master that demanded special instruction. She took classes to learn how to play with light and time, with depth of space and the grading of filters. Absorbing knowledge from where she could and from whom she could she eventually mastered the replacement camera. Paulina Lavista was the first to discover her creative eye. 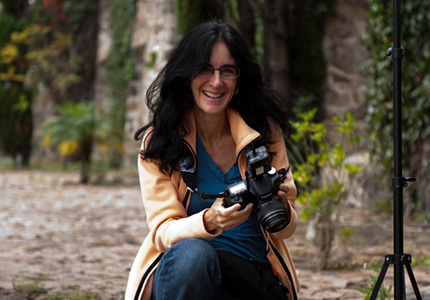 After Rosi participated in international workshops in Chicago, Vancouver, Miami and San Miguel de Allende as a student of renowned photographers like Ralph Lee Hopkins, Raul Touzon from National Geographic and David Hobby from Santa Fe workshops. Every year Rosi exhibits her work and some pictures have received accolades in publications like Black & White magazine in 2009 and 2011, and the special edition of the Santa Fe Workshops Calendar in 2009.